More than 6 million children between the ages of 4 and 17 had been diagnosed with attention deficit hyperactivity disorder (ADHD) as of 2011, according to the Centers for Disease Control and Prevention. It’s a complicated disorder with a long history. In order to cope with the symptoms, children with ADHD need continuous support from parents, teachers, and school counselors. School counselors are especially poised to serve as a key intermediary between parents and teachers and can be essential in helping students with ADHD thrive. The term “attention deficit disorder” was first coined in 1980 when the Diagnostic and Statistical Manual (DSM) — the industry standard publication for psychiatric diagnoses — published its third edition. Since then, “ADD” and “ADHD” have become relatively ubiquitous in American vocabularies, yet they do not exist simultaneously. In fact, they are mutually exclusive terms. As research poured in in the 1980s and 1990s, the DSM adjusted the nomenclature to reflect new findings. Specifically, “attention deficit hyperactivity disorder” was introduced in the 1987 edition and appeared again in 1994, this time with three subtypes: predominantly inattentive subtype, predominantly hyperactive/impulsive subtype, and combined subtype. With the DSM 5, these have been re-termed as “presentations” (i.e., predominantly inattentive presentation, predominantly hyperactive/impulsive presentation, and combined presentation) owing to the research suggesting that children can have different presentations over time. The Attention Deficit Disorder Association has a helpful fact sheet with more details on the evolution of ADHD’s nomenclature and its subtypes on its website. Ultimately, while many use the terms “ADD” and “ADHD” interchangeably, the latter is technically the correct, up-to-date term. Some may think, “Don’t most children experience these ‘symptoms’ at one point or another during childhood?” — and they’d be right. The difference for children with ADHD is that these behaviors never subside and often worsen over time, and must result in impairment in key domains of functioning (e.g., social, familial, and academic), and often co-occur in two or more settings. Ultimately, ADHD is chronic for many affected children, impeding their social and academic lives well beyond their childhood and adolescence. According to the nonprofit Children and Adults with Attention-Deficit/Hyperactivity Disorder (CHADD), “more than 75% of children with ADHD continue to experience significant symptoms in adulthood.” As such, school counselors and educators have an opportunity to support children and teens with ADHD to develop effective techniques to manage their symptoms in school, and maintain them into adulthood. More than 75% of children with ADHD continue to experience significant symptoms in adulthood. Children with ADHD can have a particularly hard time managing their symptoms in school environments. For example, experiencing difficulty sitting still during class, having trouble waiting for a turn during an activity or conversation, or being unable to play quietly and independently are not only disruptive behaviors, they also interfere with a student’s social, emotional, and academic development and functioning. With up to roughly 11 percent of children ages 4 to 17 diagnosed with ADHD, school counselors serve as an important support system for children with ADHD and their families, as well as an essential resource for teachers and other professionals who work with students in and outside of the classroom. Because ADHD manifests itself in many different ways (most children are diagnosed with a combined form of ADHD), counselors should be equipped with several strategies to address the many ways symptoms may occur in students. Before jumping into strategies and suggestions, it’s critical to understand what skills, specifically, students coping with ADHD need help developing. “Children need to learn to develop impulse control and time management skills, as well as the ability to focus or concentrate on an undesired task,” said Rebecca Newman, an early childhood mental health consultant for the Child Center of NY. If the development of these skills is ignored, “they may experience continual frustration, fatigue, poor self-esteem, or embarrassment,” she said. A big part of successfully managing ADHD symptoms is providing structure. The National Institute for Mental Health says that keeping the same routine every day and addressing any changes (such as school assemblies or field trips) as far in advance as possible is imperative. Helping students stay organized is another way to provide structure while keeping them on track with demands and expectations from homework, clubs, and sports. Evidence-based interventions (EBIs) are a primary way school counselors can provide support to students coping with ADHD. EBIs are an important part of managing ADHD symptoms, and usually occur outside of where a change in behavior is needed, such as a classroom. Anil Chacko, a professor for Counseling@NYU’s online master’s in school counseling program, said there are specific strategies that school counselors can implement when working with students who have ADHD. 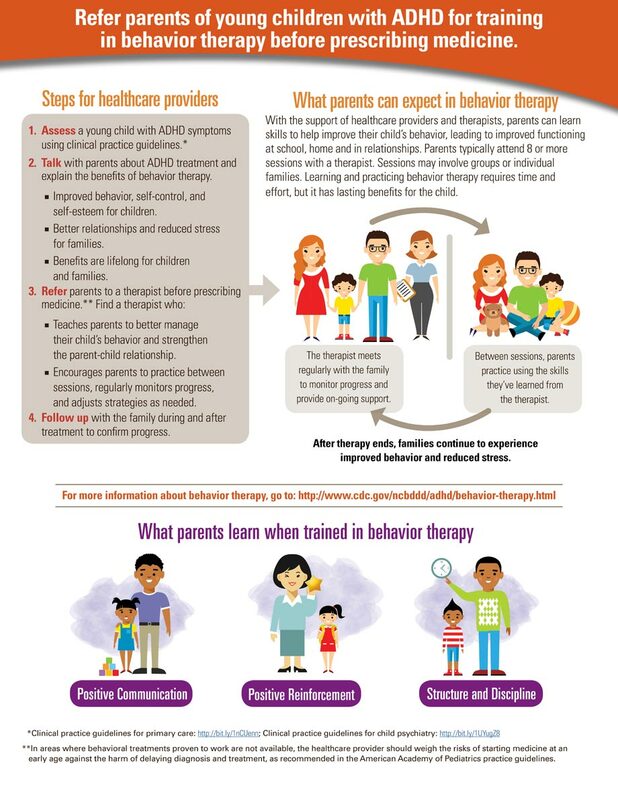 Research as recent as 2016 found that with early intervention for behavioral therapy, children who received behavioral therapy first before other interventions (such as medication) received “four fewer rules violations an hour at school than the medication-first group.” This is not to say medical treatments should be dismissed, as they have proven benefits for helping children as well, but rather demonstrates the importance of a school counselor’s role in encouraging behavior modification. This form of therapy is also cost-effective, as the reports found behavior-first therapy cost roughly $700 less per year compared to medication-first treatment. The CDC agrees both behavioral therapy and medication are important for treatment moving forward. These intervention techniques can be implemented at any point in a student’s academic career; it’s equally applicable for elementary students as it is for high schoolers. What’s more, social and emotional learning is increasingly appearing in schoolwide curricula, which can further support a student coping with ADHD in a formal classroom setting, as well. In addition to EBIs, school counselors can train teachers to support children coping with ADHD in the classroom. It can be as simple as suggesting that teachers implement point- or token-based systems in class to reward good behavior, or as robust as dedicating a day of in-service training to identify symptoms and provide additional intervention strategies. Seating the student near the teacher’s desk or away from distractions like windows or the corridor. Splitting longer assignments into smaller segments, and providing more breaks during class time. Seating students in an area where there will be the least disruption, such as along the side of the classroom. Creating opportunities for movement throughout the day, such as completing assignments sitting on the floor or helping with class activities (e.g., handing out activity sheets). Newman adds that using “first/then” statements — such as “First push your chair in, then come sit for story time” — with children, and directing them to assist during class time will help them both refocus their energy and also feel valuable. A general best practice is for school counselors, teachers, and parents to offer praise and reward when children coping with ADHD exhibit good behavior. The NRC has additional resources for teachers on supporting students with ADHD for reading, writing, and math accommodations, and general classroom instruction. ADHD is a relatively well-known mental disorder and is subsequently stigmatized — discussions of ADHD as a “fake” disorder on mainstream news sites don’t help, either. As such, ADHD is oversimplified or even appropriated with things like “AD/HD” T-shirts and an endless meme stream across the internet. Beyond the web, stigmas of ADHD are found in television. Season 2 of Netflix’s wildly successful Unbreakable Kimmy Schmidt references an ADHD medication, Dyziplen, that transforms rambunctious kids into slow-moving, deadpan pseudo-robots. A big part of empowering children to manage their ADHD is providing them with interventions, therapies, medications, and lots of support from adults in all aspects of their life. But when it comes to stigma, speaking up in defense of your child is a great way to fight it, just as this parent did in reaction to the Kimmy Schmidt episode last year. When it comes to stigma, speaking up in defense of your child is a great way to fight it. Provide positive communication and reinforcement; praise and reward good behavior with things as simple as stickers. Create and maintain as much structure in their day-to-day life as possible, such as providing written to-do lists for chores. Practice strategies at home that are covered during therapy sessions. Additionally, Chacko encourages parents to learn more about available behavior parent training programs – arguably the most well-studied and effective “therapy” for children with ADHD and related oppositional problems. As with many misunderstood mental disorders, the best way to change the conversation is through an amplified voice. In terms of supporting parents, school counselors can educate them on support groups, online forums, and through websites like CHADD. When sharing our graphic and referencing our data, please cite us as "Counseling@NYU, the online masters in school counseling program from NYU Steinhardt."